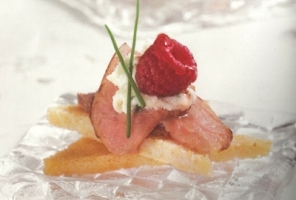 - Marinate duck breasts in pear juice and red wine for 30 minutes. - Before cooking, brush duck breasts with olive oil and season liberally with salt and pepper. - Grill on medium- high heat for about 4-6 minutes per side for medium rare. Remove from grill and let rest for about 3 minutes. - Cut challah bread into points and toast. - Slice duck very thinkly and against the grain. Place three slices of duck breast on each challah toast. - Dollop with mascarpone cheese / chive mixture and finish with 1-2 raspberries dredged through chile pepper jelly. Serve immediately.